The general understanding about homosexuality in society today has changed quite significantly since I was a teenager in the late 1980's and early 1990's, which is something that I'm very greatful for. During the first 25 years of my life I was subjected to daily negative messaging about homosexuality as well as heterosexist expectations that were just the commonplace, accepted way of thinking back then. Growing up in such an environment affected me on a very deep psychological level, and is the cause of my internalized homophobia. Understandably, it seems strange that someone who is gay could themselves be homophobic. Hearing such negativity so often as a child and then as a teenager, I essentially became hard wired to respond to anything gay in a homophobic manner... to push it away, avoid it, or suppress it. Because of this I've had to struggle for most of my life with accepting my sexuality, even though there was nothing wrong with me to begin with. "Biker Mikey" version 1: The Cyclist! 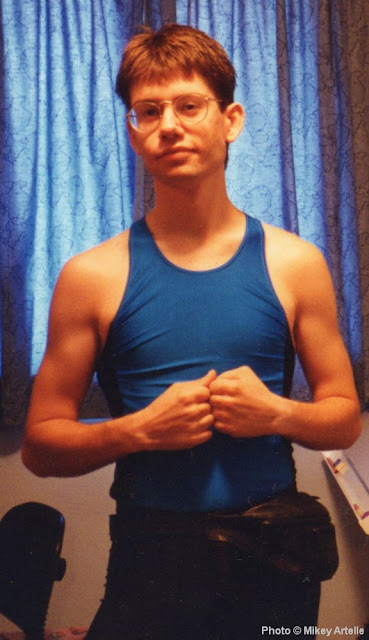 At age 18 in 1992, after I had finished High School and was finally "free at last", I experienced a profound transition in which for a brief period of time I stopped feeling ashamed of myself for being gay and began to think more positively about myself and my body. After so many years of being nervous and on the edge about the possibility of someone finding out that I'm gay, the constant worrying had left me and I felt alive again. In school I had always avoided sports and anything athletic, thinking myself to be too slim and weak, but this new sense of positive energy made me realize how wrong I was. So I decided to use the summer to explore doing athletic things such as working out, swimming and cycling. Although I was quite shy, I allowed myself to be bold enough to buy a pair of spandex cycling shorts and a tank top (which I'm wearing in the above photo)... and then managed to get my nerve up to wear them in public while riding my new mountain bike. On those bike rides I felt as free as a bird and relaxed as the wind rushed around me. That was a really good feeling. Cycling very quickly became my new favourite thing to do. For the first summer in a long while, I felt proud to me. Previously, when I was in my mid teens back in 1988 and 1989, I began to struggle with being gay which unfortunately continued through to my adulthood. Everyone has their own thing to deal with and like it or not that was mine. On a social level, being both extremely shy while worrying about being ridiculed for being gay was quite a challenge. I was very afraid of being outed and having my secret discovered because I had been convinced that being gay was shameful. Of course, I know now that there's nothing shameful at all about being gay, but there are times when I still have trouble with it none the less. 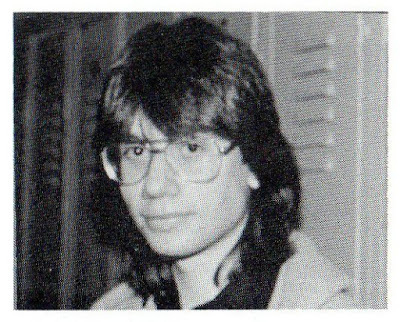 Here I am in 1989 when I was 16 and in grade nine. I had grown my hair long and was well into my rebellious phase. On the inside, I was very angry about being gay and having to suppress all of my thoughts and feelings. There was also a part of me that hated myself for being gay which became more problematic as my homosexual feelings became harder to ignore. Despite all of that, my new leather jacket made me very happy, I loved it! I had saved up forever to buy that jacket and it meant the world to me. In retrospect, it was somewhat of a life line. When I wore that jacket all my troubles faded away, it made me feel like Superman. 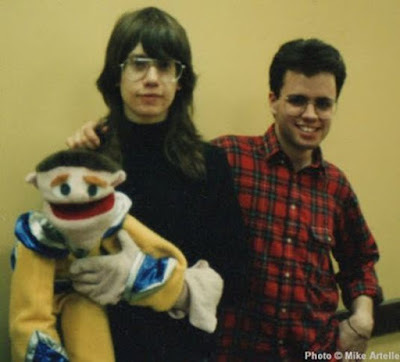 Here I am with my older brother Steven after a puppet show that I did in high school, in 1990. I also have an older sister, Shannon. Both of my siblings are awesome, though I didn't tell either of them that I was gay until my early 20's. Around the age of nine in the early 1980's I became captivated with puppetry. Later during my mid teens in high school, I put on a puppet play in the drama department with some classmates. My brother Steven helped out with some of the puppet voices. This production allowed me a much needed escape from all the worrying about being gay and struggling to figure out who I was. It allowed me to just think about puppetry. I would become happily lost in any creative project that came along, and enjoyed them all very much! My friend Bronwyn took this photo of me when I was 18. It was later published in the 1991-92 school year book. I was much too shy to let her take the photo at first, so she had to convince me to do it. I'm glad she did. 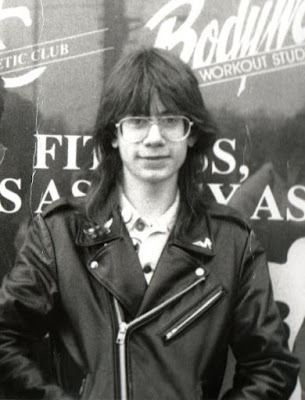 Somehow during those years I managed to become both handsome and nerdy at the same time. Love those huge glasses! Back then nobody knew that I was gay, at first, not even me! From around the age of eight or nine I knew that I was "different" but didn't fully understand it until my mid teens. Of course once I fully clued in the situation terrified me. My instinct was to keep my gayness a secret, and even deny to myself how I really felt. For me the term "gay" was not a part of my awareness until the 1990's, when I was in grade ten or eleven, and I never knew what "homosexual" was until the late 80's in grade seven. But up until then I was well aware that a boy wasn't supposed to like other boys other than for friendship, and if you did like boys more than you were supposed to it meant that you were cast out as being strange and perverted, or worse. In all honesty, talking about being gay still isn't easy for me but I'm working on it. Back then I had attended a catholic school, was often taken to mass at a catholic church, and I had catholic friends and a catholic family. So I suppressed my feelings as best I could, and in doing so supressed a significant part of my identity. Even today, at 40 something, I'm continuing to learn how to breathe easier and to not worry so much about letting people know that I'm gay... to just be my genuine self. This excludes the pictures that were found online.